Here is a slower one allowing time for explanation, one with smaller labels, one with a different title, one with a dark background, and finally a slow version on a dark background. Let me know on twitter if you would like any custom versions! This animation shows a zoom out from 0.015 au to 25 au in a hypothetical solar system containing all the exoplanets we have detected so far, plus the planets in our own system. Each planets colour indicates the type of star they orbit, from cool, M-dwarf-orbiting planets in red to planets around hot, F-types in blue. Solar system planets (and their orbits) are in green. (Click here for a 75mb .gif version, and here for a stremable version). I hope what this animation shows is that we’re getting really good at finding planets close to their star, but when it comes to more distant planets, even just those as far out as Mercury or Venus, we’ve still got much work to do! PSR J1719-1438 b which literally grazes the Sun here, orbiting its tiny neutron star parent once every 2 hours! Trappist-1‘s seven planets are noticeable because they’re on very short orbits and also move really slowly because their star is so low-mass. Highly eccentric planets like which swing through the inner system rapidly are cool. 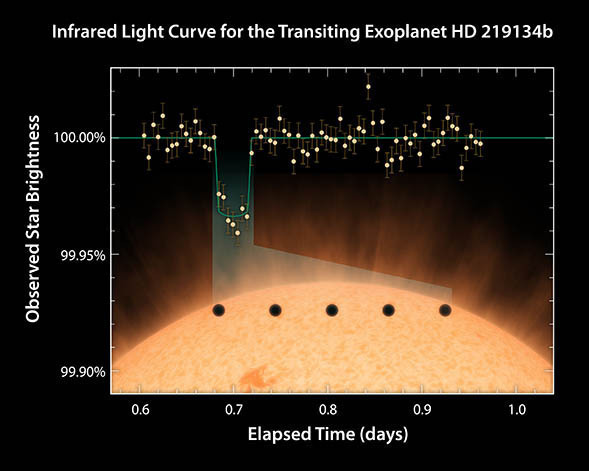 Try to spot HD80606b, the most eccentric exoplanet known! Exoplanet orbits and radii are taken from NASA’s exoplanet archive. Planetary orbits were generated with PyAstronomy’s Keplerian motion package. Orientations were randomly generated. 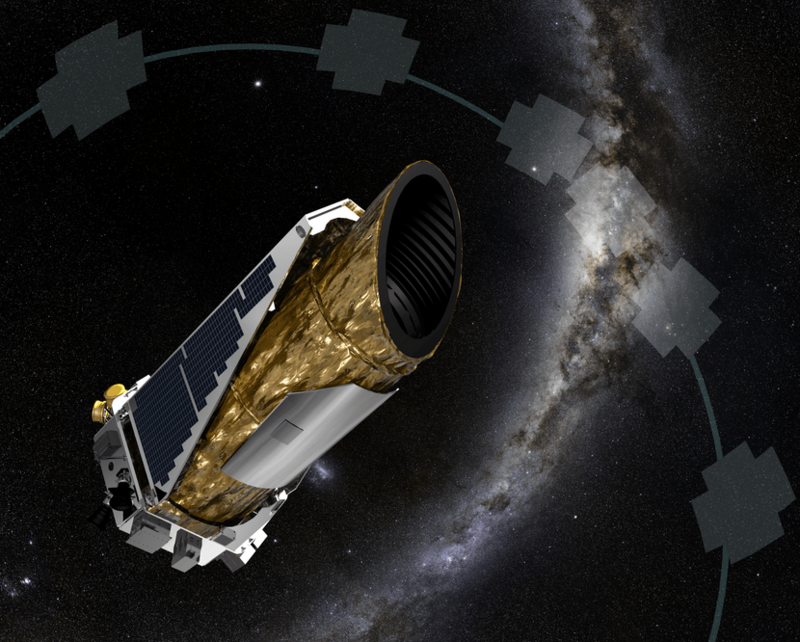 It’s now more than a year since the Kepler space telescope renewed its search for transiting exoplanets. It has spent that time looking at a series of parts of the sky for 80 days at a time, substantially shorter than the continuous 4-year view of the original mission. However, the number of planets it should be able to spot as they cross their star remains the same. So, with K2’s limited campaigns, it should see many long-period planets that transit only once. 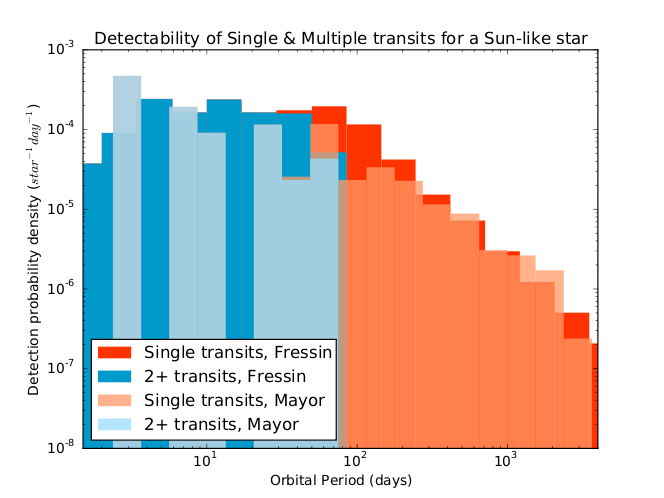 In fact, using a couple of different estimate for how many planets are out there, we expect to see a detectable single transit around every few thousand stars in K2. Given that it looks at nearly 20,000 at a time, there should be a lot out there to find! But without seeing a second or third transit, there would seem no way to estimate the orbit of the planet. However, with such good in-transit data from Kepler and knowledge of the planet’s parent star from it’s colours, we can begin to estimate such planet’s orbits. To do this, I developed the transit modelling code (Namaste: An Mcmc Analysis of Single Transiting Exoplanets), which estimates the planetary velocity across the star, and uses Kepler’s laws to turn this into an orbital period. To test this code, we tried it out on six known Kepler planets, which gave extremely promising results, with orbital period estimates often within 10%! We then had to go hunting for them in K2!To do this we ran a transit model along the curve, storing wherever it found a good. We also checked the resulting transits by eye, and found a few more it inexplicably missed along the way. The results of that were the seven dips you see below; our best single transit candidates. Three more of these single transits are ambiguous – they could come either from binaries or planets. The uppermost signal, however, is exceptionally well-constrained and very likely to be a planet. We estimate that this object, which crosses the 11th magnitude star EPIC203311200, has a circular period of 540 +410/-230 days and a radius 0.51±0.05 times that of Jupiter. If it turns out to be planetary (and I’m speculating here), this would make it a mid-sized gas giant placed at the outer edges of its star’s Habitable Zone. 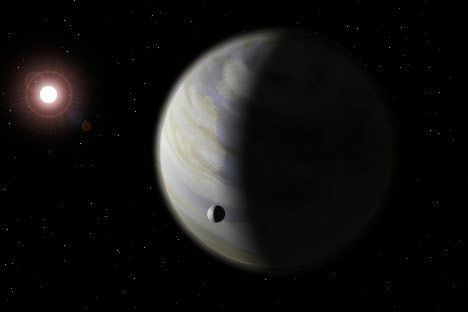 And while gaseous planets are inhospitable to life, the possibility of habitable or even inhabited moons around EPIC203311200b cannot be ruled out. 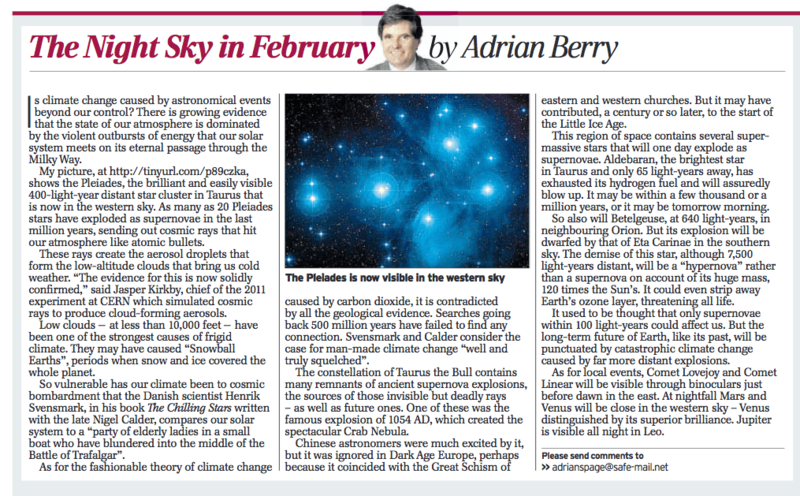 As with all planet candidates, however, we need to do more work to confirm this hypothesis. This includes weighing the planet with radial velocity observations and searching for contaminating stars with high-resolution images of the star. But with many similar missions to K2 (for example, TESS and PLATO) on the horizon, finding and analysing the single transits of long-period exoplanets is likely to become extremely important. It could even let us find planets that can be confirmed by the Gaia mission or future direct imaging. Alternatively, such planets could let us use JWST to sample the as-yet unstudied atmospheres of warm- and cold-jupiters for the first time. I should point out that this paper is under peer review and may change somewhat on publication. We decided to put on arxiv for a few reasons; the first being that, as evidenced by two candidate papers last week, K2 papers just seem to be going that way. 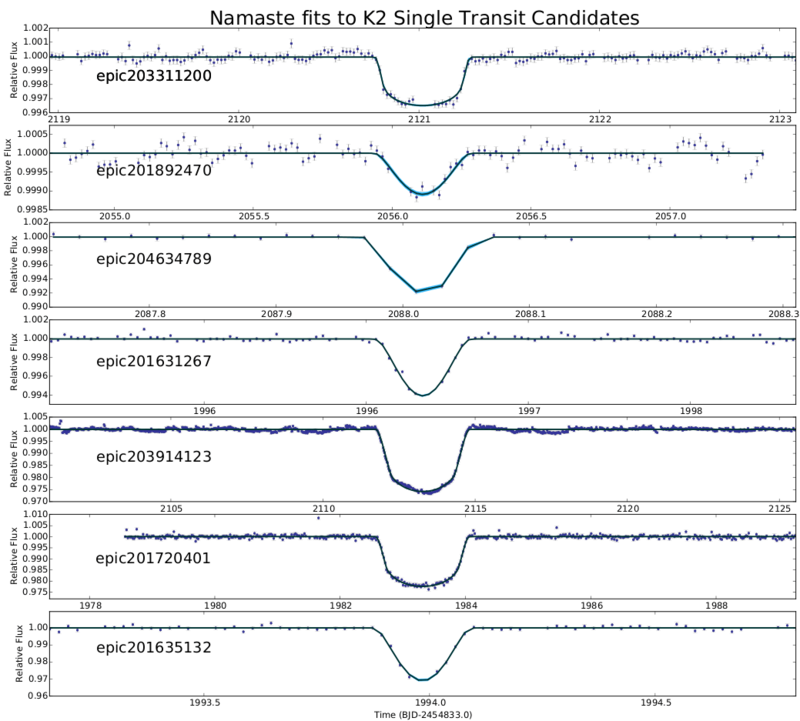 The second being that the excellent Planet Hunters team released a similar technique for single transiting Kepler planets last week, and it felt logical to try to release them close together. I will also be releasing the transit analysis code Namaste on my github this week (it needs a few tweaks and additions before it’s useable by anyone else unfortunately). In December 2014 and June 2015, I was lucky enough to visit La Silla in Chile. Part of the European Southern Observatory, La Silla is home to dozens of working telescopes. My baby for both occasions was the 1.2m Swiss Telescope, designed specifically to search for exoplanet via the radial velocity technique. I also happen to enjoy photography (some of my work is here), so turned my camera to the skies most nights during both my two-week stays. This video is the result of nearly 10,000 photos taken on those trips. Hope you enjoy it! Feel free to share it far and wide. I was using a Nikon D3200, a remote shutter (although when this broke, an elastic band over the shutter did the job), a Hama tripod and both the basic Zeiko 18-52mm lens and Sigma 12-24mm wide-angle lens. I also used my GoPro occasionally for the twilight sequences. In total, I took around 10,000 photos totally around 200GB of photos. Exposure times were from 25 to 40 seconds and ISO levels from 400 to 1600. In total, I ended up with about 60 sequences of ~1hr in length, totaling 1.5 days of shutter open time! The first batch (from December 2014) went on a hard-drive that later broke, so a few dozen other timelapses were lost. I used UFRaw to reduce the images convert to jpg, Panolapse to create the moving timelapses and Lightworks to assemble the video. I’m not happy with all of the images; some have been poorly reduced, some were set at too high an ISO rate (made worse by the poor noise properties of the D3200). But this is my first (or maybe second) venture into Astrophotography, so I figure I’m allowed to make a few mistakes! The music is Modern Drift by Efterklang, all rights for which are the property of 4AD & Rumraket (used under fair use guidelines). EDIT: The video was, unfortunately, taken down by Vimeo for not constituting ‘Fair Use’ (I believed that a non-profit, educational video such as this adhered to Fair Use, but apparently vimeo disagree). It is now up on Youtube who have a less stringent fair use policy. Last week I gave my first proper talk to a conference of PhD students from nearby universities. Being an easily distracted man, rather than actually write my talk, I decided to spend the day before putting together an animation of the entire history of Planet Detection, from 1750 to 2015. It shows the orbital period (x-axis), planet mass (y-axis), radius (circle size)* and detection method (colour) of the 1800+ planets now known. The idea of this plot is to compare our own Solar System (with planets plotted in dark blue) against the newly-discovered extrasolar worlds. Think of this plot as a projection of all 1873 worlds onto our own solar system, with the Sun (and all other stars) at the far left. As you move out to the right, the orbital period of the planets increases, and correspondingly (thanks to Kepler’s Third Law), so does the distance from the star. Moving upwards means the mass of the worlds increase, from Moon-sized at the base to 10,000 times that of Earth at the top (30 Jupiter Masses). The colours are also important – dark blue shows the solar system planets (which include Ceres and Pluto for a few deacades each); In light blue are RV planets, which began the gold rush in 1995 with the discovery of 51 Peg; In maroon are Direct Imaging planets; in orange the microlensing discoveries; and in green those planets found by the transit method. The top left has a dense cluster of large worlds. These are the Hot Jupiters. We know of loads of these, even though they’re pretty rare, simply because they are easiest to find. Being so close to their star they produce the biggest radial velocity signals (light blue) and are most likely to transit (green). Ground-based transit surveys like WASP cant find anything beyond ~15 days, causing the sparse region to the right of this group. The top right cluster is a population of Jupiter-like worlds that Radial Velocity is best at finding – anything beyond 10 years is too long at the moment to have a full signal. The bottom group is from the Kepler space telescope. This clustering is the only one that’s actually real and not just a systematic effect. This is because Kepler was capable of finding every type of planet down to ~1 Earth radius. So this clustering shows that there are more Earth and super-Earth sized planets than any other. Hopefully we can begin to probe below it’s limit and into the Earth-like regime, where thousands more worlds should await! Hope you enjoy it, and feel free to borrow it for your own use! *Where Mass or Radius were unavailable I used the Mass-radius relations of Weiss & Marcy. Information from exoplanet.eu, so it might be a bit wrong. Thanks to Matt Kenworthy for suggestions. Pulsar planets are not plotted. Lunar Mission One – Can It Succeed? 73%. That’s what former Minister for Science and Chairman of Lunar Missions Ltd Ian Taylor reckoned the chance of success of Lunar Mission One would be. This number, on the face of it, appears to be reasonably precise. Assembled from a detailed analysis of all the risks, you might think? No. In reality, like much of his talk this evening, it was a fudge – pieced together on the fly, with little scientific substance to back it up. 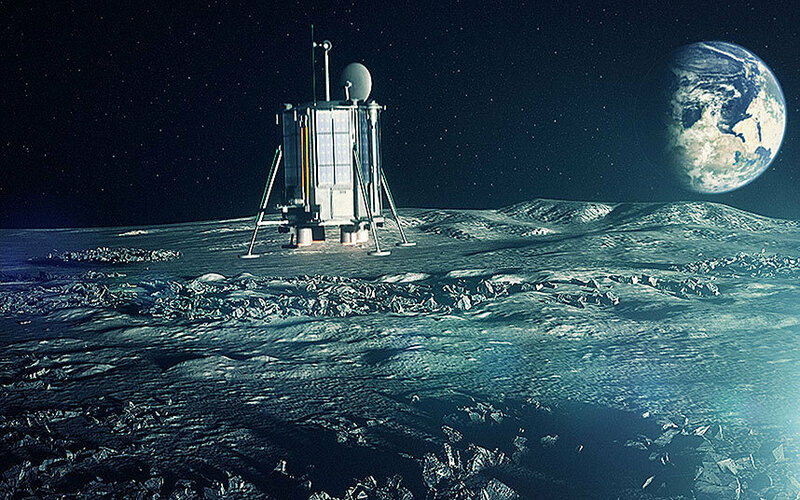 Lunar Mission One is a crowd-funded space mission. Started in late 2014 by a wide array of collaborating UK institutions which Ian Taylor listed with pride. 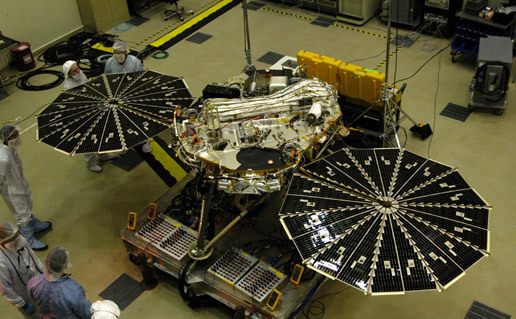 It plans, in the early 2020s, to send a probe to the Moon and perform cutting-edge scientific research. They pitched the idea to the public via Kickstarter and, by the skin of their teeth, made it to the £600,000 goal needed to start developing the idea. Their ultimate goal is to produce a mission for everyone. (Where, as far as I can work out, ‘everyone’ is those who have donated sums of money to the cause). Their scientific principle, at least, has merit. They will fly a large probe to the unexplored Shackleton Crater at the Lunar South Pole and use cutting-edge drilling tools to make a ~100m hole in the lunar ice and rock. The geology of this borehole could reveal untold secrets about the history of the Earth-Moon system and make literally dozens of British Lunar geologists quite happy. The team will then fill in this hole with “Memory Boxes” – digitised containers that members of the public can, for a small fortune, fill with their most treasured memories and unwanted iTunes collections. These will then sit under the lunar crust for 4 billion years before either being fried by an expanding sun or rescued by some helpful intelligent alien species. Despite lots of long-winded answers-that-weren’t-quite-answers, Ian Taylor did not really fill us in on just how such a mission might be funded. The £600,000 raised so far is only 0.1% of the budget needed to get a space probe to the moon. He suggested international collaborations could easily get the funding necessary, but with most western countries already invested in their own agencies (eg ESA), where and why would any extra funding end up in a British company’s hands? 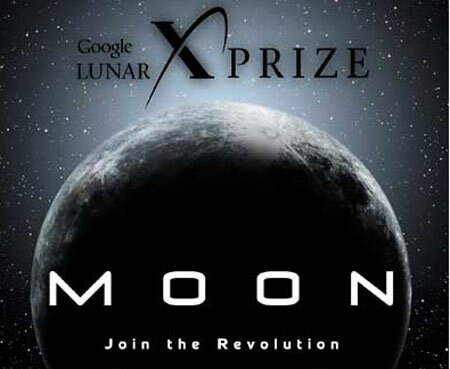 The Google X-Prize contenders, who set to reap a $35million bonus for landing on the moon, tell a cautionary tale. Backed by a combination of crowd-funding and business investments, not one of the half-dozen teams involved made it to the Moon by the 2012 deadline. Twice this has been extended, and twice the teams have failed. Even private investors such as Virgin Galactic or Space-X, who have a profitable business model, have struggled with the costs and timescales involved with spaceflight. And these, which Ian Taylor was so quick to draw comparisons to, are profitable ventures. Lunar Mission One has even less potential for generating income than Mars One, another independent space mission that looks destined for failure. Most would agree that crowd-funding has its limits, and £600million is above that limit. Way above. Another question that springs to mind is why, if the scientific concept is so good, did the institutions involved go down a private route? Why not propose directly to ESA, and face the potential of €650million reward to build the space mission? I put this to Ian, and he tried to convince me that ESA (and NASA) was hell-bent on Mars and not on the Moon, whereas the scientists he had spoken to were adamant that lunar missions are more important. (NB: Well of course they were, Ian; you spoke to Lunar Scientists. If I only spoke to the dozen White Dwarf astronomers in my department then I’d probably get the idea that the only necessary mission was to send a craft to Sirius B!) And ESA missions to Jupiter, a comet, the Sun as well as two exoplanet satellites prove that is not really the case. The selection process is done by numerous committees that select programs based almost entirely on their scientific potential. That lunar geologists cannot get their missions selected in telling. In reality, most planetary scientists would agree that there are still other more interesting places in the solar to explore than the Moon. Many of these destinations, such as our planet’s near-twin Venus, are also relatively thin on the ground when it comes to future missions. 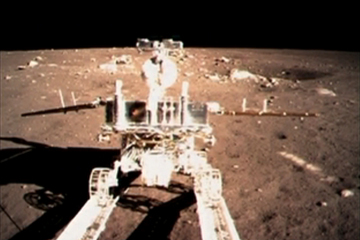 The Moon, however, is an easy target for newly-emerging space agencies such as India and China. One can even imagine a manned mission before Lunar Mission One even launches. I was cautionary optimistic when before hearing Ian Taylor and the Lunar Mission One concept. Now, after an hour of name-checking and avoiding difficult questions, I feel the opposite. The whole mission seems to lack any clear sense of direction. It seems like they caught their £600k target almost by surprise, like a dog chasing a car. Now, from that unlikely position, they must raise £599million more (£15 for every working adult in the UK) for a mission that, compared with the exploits of Rosetta, sounds uninspiring. 73% suggests Ian? My guess would be more like 0.7%.